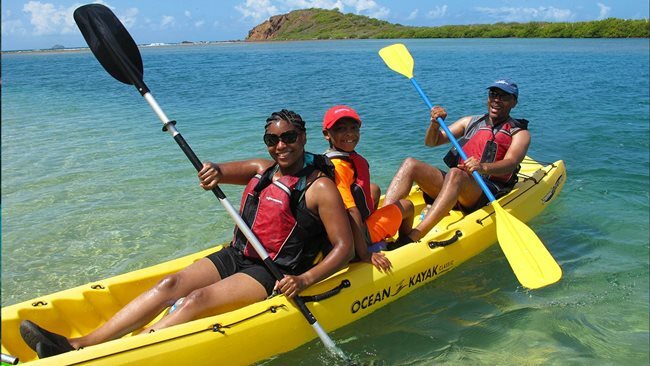 VI EcoTours has a stunning range of kayaking, hiking, snorkeling, and boat tours, from two locations, in St. Thomas or St. John in the US Virgin Islands. You can rent paddleboards, snorkeling gear, and kayaks, too. 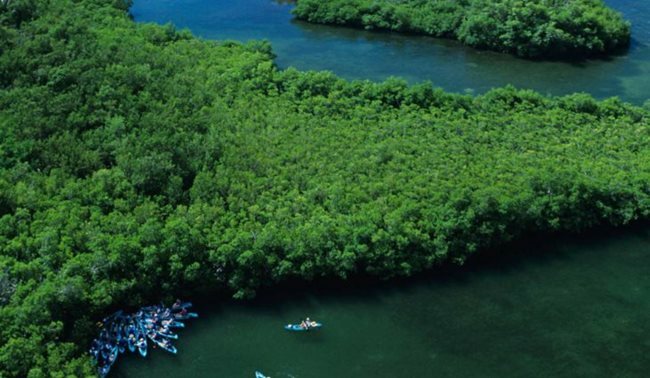 We took the Mangrove Lagoon Kayak Tour, which includes hiking, kayaking, and snorkeling. Our group was small, so we had plenty of time to ask questions and get to know our guide. Tours are all about the guide, and our guide made it fun. He was animated, adding energy to the tour. (Tourists are often weary.) His friendly manner put us at ease, and he seemed to know everything about the creatures and landscape we were seeing. He was supportive about our amateur kayaking, and didn’t feel like we had to be macho. He gave special attention to the kids on the tour. Our guide taught us a lot about the local wildlife. The kayaking and hiking were easy, and the kayaks thankfully had excellent back support. Pro tip: there is zero shade on this tour, so goop up on sunblock. Learning about the mangrove trees was interesting. 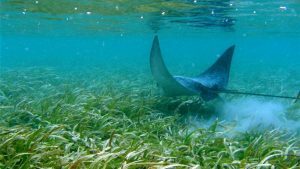 They require no land, putting their roots directly into the water and forming a whole root system that other sea creatures make use of. Our guide also told us about the recent hurricanes that devastated St. Thomas, and we even saw a ship that had been thrown high onto a small island, too high to get down. Our guide was generous answering questions and taking photos for us, with our own cameras, or more professionally for purchase after our tour. We kayaked to an island, hiked it, and saw dozens of hermit crabs. We even lined them up for a race. 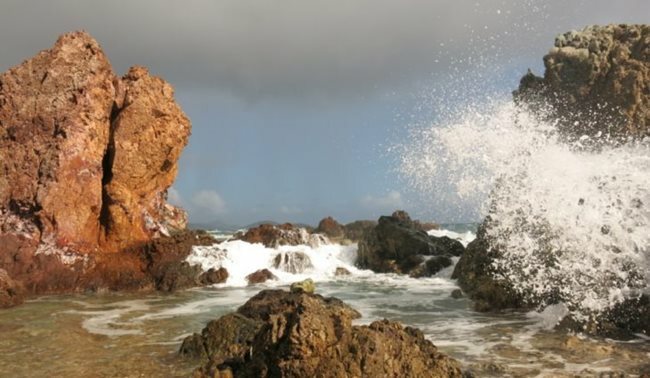 We saw the Red Point Blowhole, where most days the waves rocket through a gap in the rocks like a geyser. Those of us who did snorkel found many amazing things. We saw lots of local fish, puffer fish, blue tang (the Dory fish from Finding Nemo), yellowtail snapper grouper, a spotted eagle ray, and three octopuses. We saw an underwater boat with its tip sticking out, where the fish congregated in a school. I learned later that we also saw lots of very tiny (so tiny as to be harmless) barracuda. A few nitpicks are possible. Snorkeling was easy for those of us who were real swimmers, but a couple people in the group were afraid to go when our guide warned us not to put down our feet or we’d get stung by sea life. Some of the families fell behind in kayaking and hiking, rather than the group stopping to wait for them. In-between stops, the tour sagged at times. We saw some wonderful aquatic life, but hear that we got lucky rather than this being typical. Although there are more adventurous tours in St. Thomas, our tour was unique in teaching us about the environment. 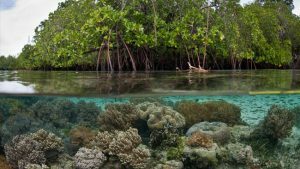 So, 4.5 stars for the VI Ecotours Mangrove Lagoon Kayak, Hike, & Snorkel Adventure. VI EcoTours offers numerous other tours that may rise to 5 stars. They can take you night kayaking, on a historic tour of Hassel Island, or out boating and snorkeling to find sea turtles.